Our lecture for the June 2003 meeting was given given by Dr. Nick Evans, a particle physicist from the University of Southampton. His talk was entitled "Understanding Nothing: The Structure of the Vacuum". He opened his talk with the background to nothing, starting with ancient philosophy and its relationship with the word nothing. The Greeks thought that nothing was the absence of properties. Existence is a property and so therefore a void cannot exist. Medieval Christian philosophy thought that nothing was equal to there being no God. However, eastern philosophy embraced the idea of void. We come from nothing. We should seek to return to nothing (Nirvana). Dr. Evans then outlined some medieval thought experiments. The philosopher Roger Bacon (circa 1250) was interested in constructing a vacuum. He argued that if he took two smooth pieces of glass which he could hold in his hand, placed them together removing the air and then pulled them apart quickly, he had created a vacuum before the air rushed back in to fill the gap. This thought experiment created much argument but few conclusions. Sound does not travel in a vacuum. Animals can't survive in a vacuum. Light can travel in a vacuum. The nature of the vacuum is still an important area of scientific research. In the vacuum there are strong nuclear forces at work, similar to electromagnetism. The theory of quantum chromodynamics explains the strong nuclear force by stating that hadrons (the class of particles including neutrons and protons) are composed of fundamental particles known as quarks. These quarks communicate by exchanging massless virtual particles known as gluons. The vacuum is really full of quark and anti-quark pairs with a density comparable to an atomic nucleus. If this didn't exist, all matter would pull apart. Using this information, scientists tried to model the universe but something was wrong as the universe was calculated to be the size of a grapefruit! 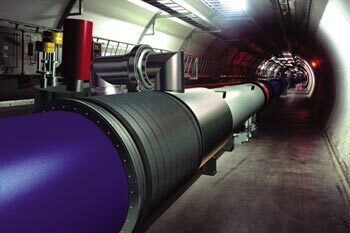 A newer theory is that the vacuum is also full of another sort of matter – the Higgs Boson. To find the Higgs we must excite the vacuum to produce a Higgs particle. It is hoped that the new Large Hadron Collider in Switzerland will find these and give us more answers when it starts operating at full power in 2008.